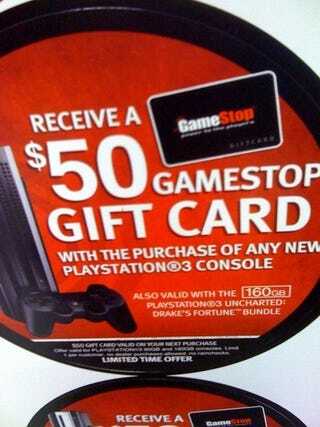 A friendly tipster sent in this picture they say they snagged at a GameStop showing that the national retailer will be offering a $50 gift certificate with any purchase of a new Playstation 3. The deal, we're told, kicks off on March 3. If you're not in the mood to wait, Best Buy is currently offering a $50 gift card and a copy of either Guitar Hero: Aerosmith or Guitar Hero III: Legends of Rock when you by the 80GB PS3 for $400. While the GameStop still should be taken with a grain of salt, if true both deals bolster recent rumblings of a Playstation 3 price drop. "Recent channel checks indicate increased speculation for a PS3 price cut announcement from Sony in the next couple of days," wrote Hickey. Could the Best Buy and GameStop deals be predictors for an upcoming $100 price drop?